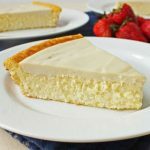 This cheesecake pie recipe is my wife's and she made it for dessert for most of our dinner parties. It was always a hit and she always handed out the recipe to her friends.Note: You can change the number of people served by placing your cursor over "Servings". The Ingredients will adjust to the new number of servings. Preheat oven to 350 degrees F. Have all ingredients at room temperature before beginning. Roll out 20 graham crackers into crumbs. Mix well with the melted butter, the sugar and cinnamon. Line a 9-inch pie tin, bottom and sides, with the mixture and bake for 5 minutes at 350 degrees. F.
Mix the cream cheese, sugar, eggs and cinnamon until completely blended. When completed, fill-in the baked shell and bake 20 minutes at 350 degrees F. Allow to cool before adding the topping. Remove from the oven and chill overnight before serving. Any number of garnishes can be put on the topping, bread crumbs, chopped peanuts, zest of lemon or sliced strawberrys. Or you can use your own favorite topping.